As she talks about her 60 years as a Catholic educator, it’s fitting that Benedictine Sister Louise Hoeing mentions two quotes dealing with the heart. After all, she has given her heart in six decades of trying to help Catholic students grow closer to God and use their gifts to make the world a better place. The second quote that the 79-year-old religious sister mentions is from St. Benedict. 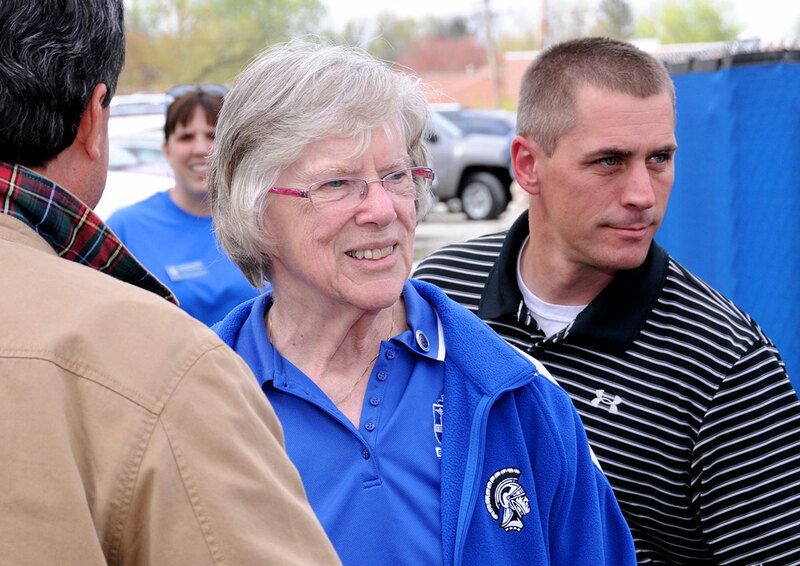 Sister Louise’s heart, dedication and influence will be celebrated on Sept. 29 at Bishop Chatard High School in Indianapolis—the place where she served for the past 38 years before retiring earlier this year. The celebration will begin with a Mass at noon at Christ the King Church in Indianapolis, followed by an “open house reception” from 1 p.m. to 3 p.m. at the high school. As part of the celebration, school administrators have invited people to share their thoughts about Sister Louise, an invitation that has already led to numerous tributes. One of those students recalled the influence that Sister Louise had on her and later her daughter. “My four years as well as my daughter’s four years were all marked with your constant smile and love,” wrote Paula Feist Smith, a 1989 graduate whose daughter, Melissa Smith, graduated in 2010. Sister Louise and the late Richard Powell, her longtime friend and Bishop Chatard teacher, had a tradition of attending the wakes and/or funerals of anyone associated with the school. In her longtime role as a guidance counselor at the school, Sister Louise strived to have the students think about the long-term impact that they could have with their lives. That goal has marked her own life. At 19, she began her career in Catholic education, teaching at St. Ambrose School in Seymour where she once guided a class of 55 first-grade students. She later became a teacher and principal at St. Anthony of Padua School in Clarksville in the early 1960s, followed by 10 years as principal of the former Our Lady of Grace Academy in Beech Grove. And even though she has officially retired from Bishop Chatard, she still volunteers at the school, helping with alumni relations. “The alums are where my knowledge is right now, and it gives me something to get up for. And it’s fun,” she says with a smile. That smile has marked her 60 years in Catholic education—60 years in which she has made an impact on others, 60 years in which the students and her fellow staff members have made an impact on her.